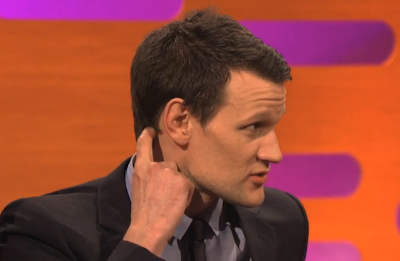 Matt Smith and David Tennant were recently guests on The Graham Norton Show in Celebration of the 50th Anniversary of 'Dr. Who'. The following is the dialog from 1:50 to 2:04 of the video above. Norton: "Is it the thing about the Musical, of 'American Psycho'. Is that true?" Smith: "Yea, I'm - rehearsing it now." Norton: "Oh, so it's that soon?" Williams: "Right ah, I'm not the best for that." During the entire segment from 1:57 to 2:02, Smith scratches behind his right ear (specifically on the posterior base of his right mastoid process). He does this 17 times (see below). Scratching of this area is consistent with honest anxiety. Smith is clearly quite stressed about his singing in 'Psycho'. Do not confuse this with "The Ear Screw", "The Ear Tug" - or scratching just below or in front of the ear. These other facial nonverbal MAPs (Manipulators, Adaptors, Pacifiers) often have less straightforward meanings depending on the other body language signals with which they are clustered. Do you know what these body language signs can indicate?